We asked Tom Riddle why he chose an Image boat, and he implied that it came down to build quality. One of his key requirements was beach launching through the surf, so ruggedness was at the top of the priority list. The model Tom decided on was the Fishmaster 8.0. It measures 8.5m in overall length, with an external beam of 2.7m, and features a lockable hard top cabin, a huge cockpit and a large fishing and boarding platform across the stern. 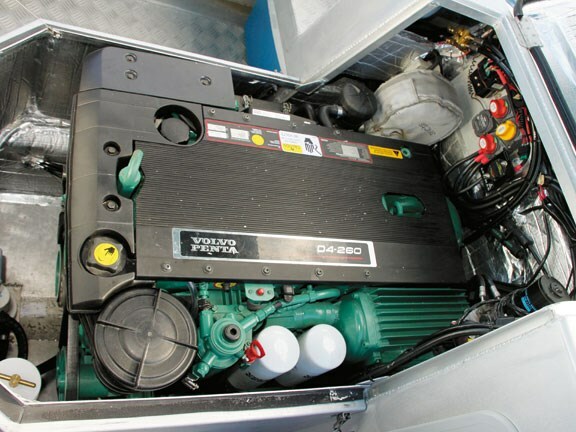 Tom also opted for the inboard Volvo D4-260 turbocharged diesel power plant, driving a Volvo Duoprop stern leg. He cites the safety aspect of diesel fuel, as well as the superior fuel economy while trolling. His boat has the 500-litre fuel tank optioned in, which at its most economical speed could provide a range close to 1000 nautical miles. The Volvo is housed under a soundproofed cover, and even under full throttle the noise was not excessive. 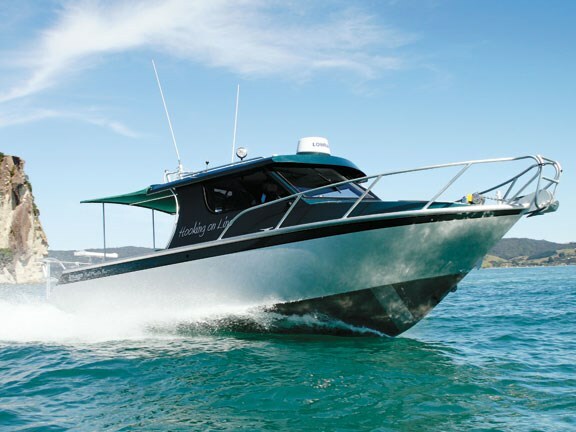 Tom is a keen fisherman, and because conditions off the Coromandel coast can turn up rough with little warning, he wanted something big enough to handle whatever the elements could throw at him. He also wanted to be able to take the whole family out with him, so required a large cabin and cockpit. With an external beam of 2.7m and a fully laden weight somewhat over three tonnes, the large Fishmaster has restrictions on towing. He therefore opted for non-road-legal trailer option with a conventional override brake. Inside the boat, the massive space was impressive. It is configured for extended trips, with four berths in the forward cabin and the main cabin seats making a possible fifth bunk. There is gas califont providing hot water, fed by a 100-litre freshwater tank, a two-burner stove and sink unit, a flush toilet, and shower in the cockpit. The helm position is dominated by the huge Lowrance HDS-10 display. This has fishfinder, chartplotter and radar capabilities installed. 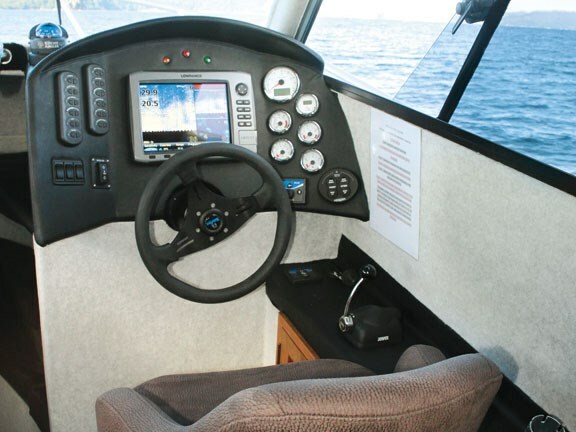 Six separate analog and digital gauges provide engine information, while controls for the Lectrotab trim tabs and Lewmar electric windlass are on either side of the dashboard. 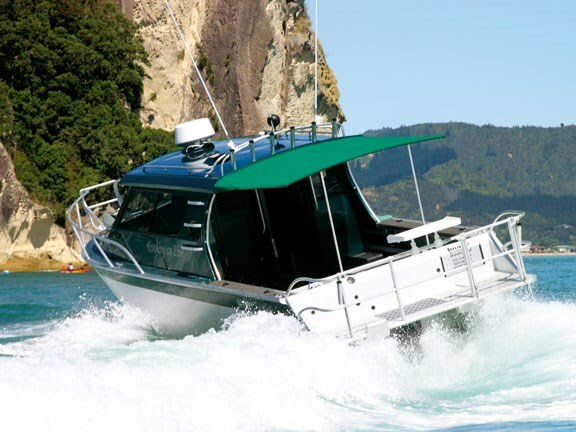 A padded and upholstered seat gives the skipper a comfortable ride, while a bench seat provides space for two passengers. A fridge is tucked below the skipper’s seat, and the sink and cooker unit is located on a cupboard behind that. 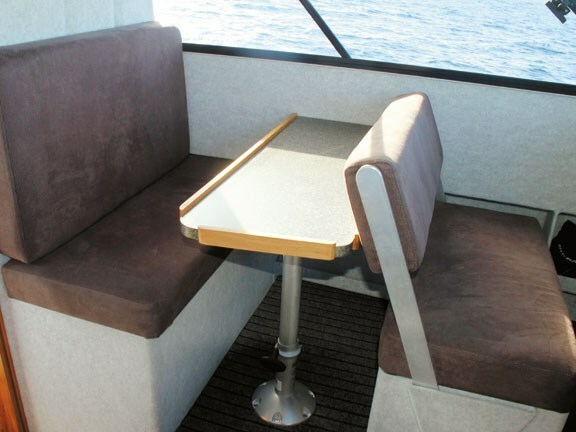 A further bench seat is located behind a pedestal-mounted table on the port side, providing seating around a table for four people. Stepping through the wide lockable doors, the main cockpit has a full-length shade cover fitted. The gunwales are wide, with rounded edges that make them comfortable to sit on. Rod holders abound, and there is a large rocket-launcher fitted along the hardtop. The starboard transom has a washbasin fitted into it, while the port side has a step-through to the boarding platform. The platform out the back serves as an excellent fishing stage, surrounded by sturdy waist-high railings. There is enough space for four people to comfortably fish without getting in each other’s way, and even a stand-up game fisherman would have enough space. An extra-wide gate through the railing swings down to double up as a boarding ladder, wide enough for a fully kitted diver to get through. The current engine configuration does not let the motor quite reach maximum revs at wide-open throttle, although we still hit around 31 knots. Tom estimates that with the right prop combination it is capable of a few more knots at the top end. The cruising speed of 25 knots was very comfortable, with the motor ticking along at around 2800rpm. We did not accurately measure fuel consumption but the gauge showed just less than 30 litres per hour at this speed. Thanks to 18-degree deadrise and the carpeting inside the cabin there was an almost total absence of the crash and bang that many alloy boats experience. Turns were very good, despite the lack of planning strakes. Turning the light hydraulic steering over hard causes the chines to bite in well, and the boat turns on the proverbial dime. Twin windscreen wipers ensure that any spray is quickly cleared. We experimented briefly with backing up, and the Fishmaster performs adequately if not brilliantly. The big bilge pump takes care of any water that gets into the cockpit. 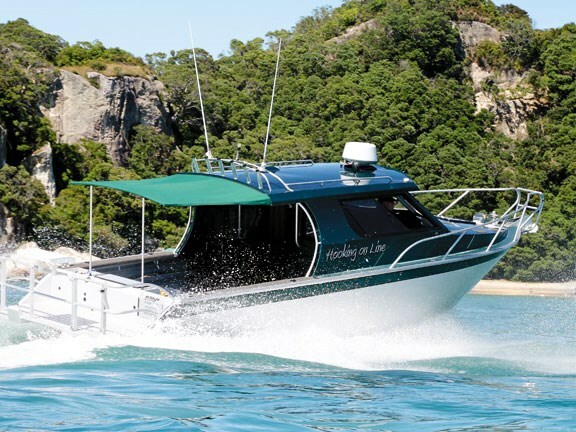 Walking around the cabin to the bow area is easy thanks to non-slip pads on either side, plus numerous grab-handles welded to the cabin. The roof is strong enough to stand on. The foredeck has a high alloy bow-rail, and the centre section of the rail swings down to form a boarding ladder for shallow water boarding. 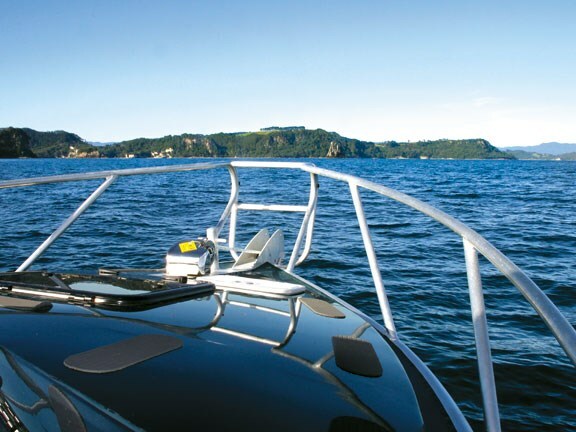 Retrieving the boat is a simple task thanks to the self-setting trailer latch. Overall this is a very impressive boat, big and solid yet manageable. It will handle almost any conditions, and has enough features to satisfy the most demanding fisherman. See Image boats for sale.